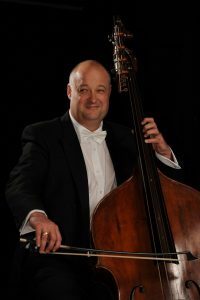 Meet Dominic Dudley – our double bass tutor for UYO 2017! We’re looking forward to welcoming him to UYO in August. Dominic Dudley was born in Dundee, Scotland, and began playing the Double Bass at the age of thirteen with Ronald Large. Dominic continued his studies at the Guildhall School of Music and Drama with Thomas Martin and Kevin Rundell. In 1994, Dominic was appointed Section Leader (Principal) Double Bass with the RTE National Symphony Orchestra of Ireland at the young age of 23. In recent seasons he has also been Guest Principal at the RPO, CBSO and the Ulster Orchestra. As a concerto soloist, he has worked with the National Symphony Orchestra of Ireland, as well as the Hiberian Orchestra, Dublin City Chamber orchestra and the Royal Irish Academy Symphony Orchestra. As a chamber musician, Dominic has played with many leading International musicians, including Nicola Benedetti, Philip Cassard, John O’Conor, the Vanburgh Quartet, the Con Tempo Quartet, the Danish Quartet, Jorg Widmann as well as numerous chamber concerts with members of the NSOI. He also performs regularly at the West Cork Chamber Music Festival. Dominic also enjoys playing in a crossover group called meascan (meaning mixture in Irish), featuring the bluegrass music of Mark o Connor. In 1996, Dominic was appointed Double Bass professor at the Royal Irish Academy of Music. Since then, Dominic has become increasingly interested in Music Education. He was a Music Facilitator for the NSOI, involving School visits and Workshops. Dominic plays on an English Double Bass by Lott 1820, as well as an instrument by his teacher Thomas Martin.